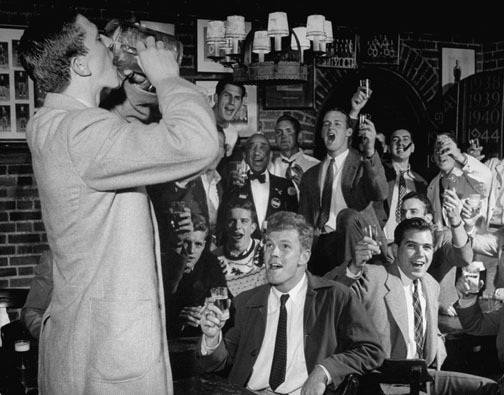 Unidentified Princeton students raise a glass at the Nassau Tavern in 1946. The tavern, part of the Nassau Inn on Palmer Square, was among the popular watering holes for students in the late 1940s, others being The Annex and the King’s Inn in Kingston. The tavern’s Grill Room was often the site of meetings for campus organizations — such as The Daily Princetonian, which held competitions for editorial positions there — and even the location of precepts. Can any PAW readers name these men or the occasion for their partying?